← Report on a BioBlitz! Pinnacles in the early mist from the North Wilderness Trail. Photo J. Meiners. 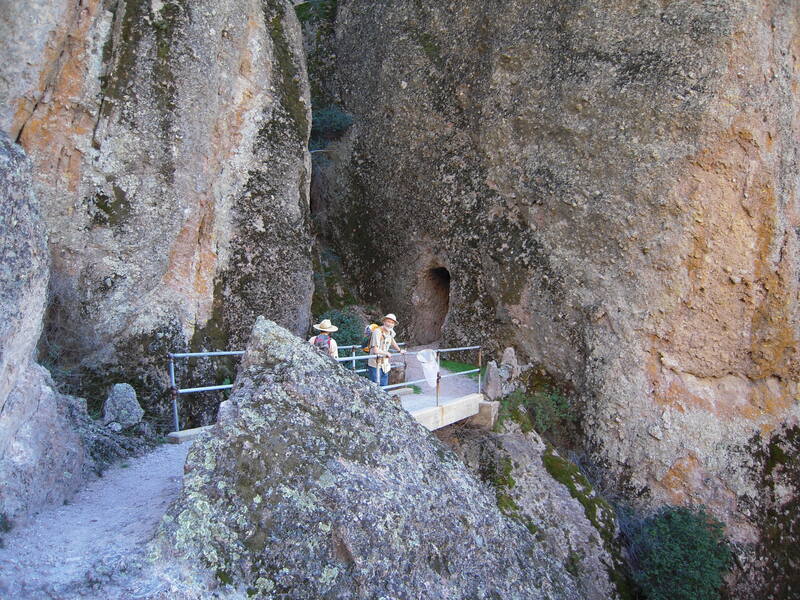 As the clock rolled over into 2013, Pinnacles National Monument was on the cusp of an overdue transformation. Originally established in 1908 by President Theodore Roosevelt, Pinnacles National Monument has nestled quietly in California’s San Benito and Monterrey counties, receiving about 175,000 annual visitors to nearby Yosemite National Park’s 3.4 million. For years, Pinnacles employees and fans have lobbied to raise the area to National Park status to increase visitation and receive recognition as one of the country’s most stunning natural areas. On January 10, 2013, President Barack Obama granted that wish, making Pinnacles the 59th National Park and the closest to the San Francisco Bay area. 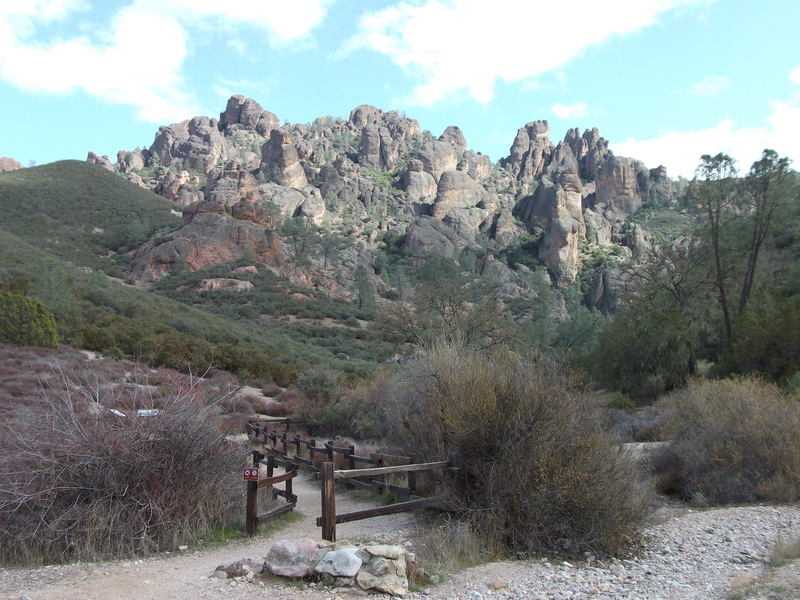 View of the iconic ‘Pinnacles’ from the start of the Juniper Canyon Trail. Photo J. Meiners. Paul Rogers reports in the Mercury News that the title change will not increase the size of the park or its budget, but is expected to increase visitation and “put Pinnacles on the map,” as Wilderness Society campaigns director Paul Spitler puts it. Pinnacles should see exponentiating traffic as it comes to be recognized among California’s other revered National Parks: Yosemite, the Channel Islands, Death Valley, Joshua Tree, Lassen, Redwood, Sequoia and Kings Canyon. Whereas National Monuments can be declared relatively easily by a US President, National Park designation must be approved by Congress and usually confers a higher level of protection for a ‘variety of nationally significant resources.’ For a protected area that predates the establishment of the U.S. National Park Service in 1916, and is a primary recovery and release site for the endangered California Condor, the elevation to Park status seems warranted. Aside from the bald-faced scavengers with ten-foot wingspans that have won the hearts of many conservationists and the malice of many tax payers, Pinnacles National Park has become known for its astonishing diversity of native bees. Thanks to opportunistic trail collecting in the 1990s by my adviser, Terry Griswold, and his student Olivia Messinger, and to my recent plot-based community sampling efforts throughout the park, Pinnacles has been discovered to house over 400 different species of bees. With a maximum sampling area of about 26,000 acres, or about 36 square miles, this density of bee diversity in such a small area has not been documented anywhere else in the world (to my knowledge–please let me know if you discover otherwise!). I won’t give away all my research punchlines just yet, but we attribute this phenomenal biodiversity to the immense variety of habitats within Pinnacles’ boundaries. Small enough to hike from east to west over the dividing Pinnacles rocks and back again in one day, the Park’s location and geologic history have brought a diverse collection of soil and vegetation types together under a dynamic climate regime. Pinnacles straddles the San Andreas Fault line, which has resulted in soil types and seed banks from the north and south being brought together in one place. The Park’s namesake rocks form a dividing wall between the east and west side that results in coastal influences being largely restricted to the west half of the park, while the drier east harbors some riparian zones. 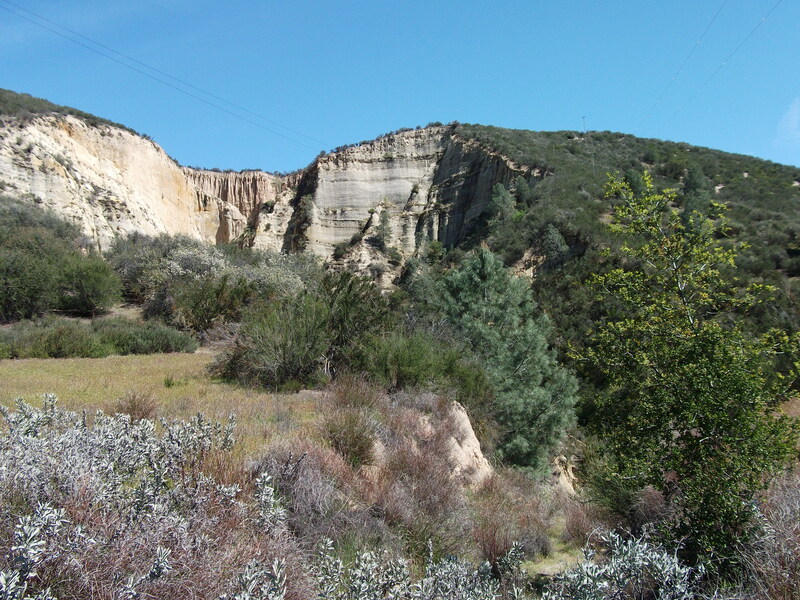 Both sides are dominated by chaparral vegetation typical of California Mediterranean habitats, but the Park is also dotted with woodlands and grasslands across its rolling hills and canyons. The ‘High Peaks’ of the Park sit about 1000 feet above its lowlands, which makes for some steep hikes and large variations in daily temperatures across areas of the park just a mile or two away from each other. It is not uncommon for summer temperatures to range from 50 degrees (F) before sunrise to 100 degrees in exposed areas at noon on the same day, while temperatures in the talus caves hover in the refreshing 50s. 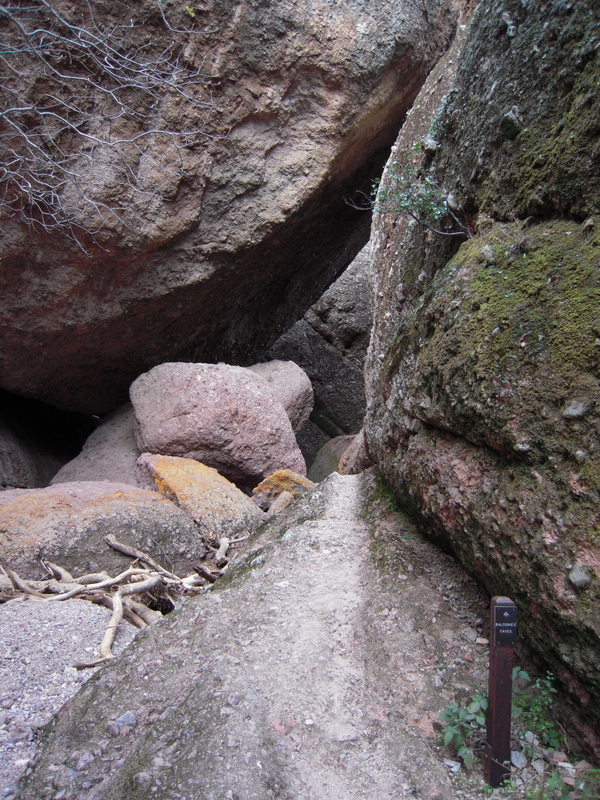 There are records from as early as 1881 of local Californian picnickers taking refuge from the day’s heat in the Pinnacles Balconies caves, now one of the Park’s most popular trails and a regular part of my daily commute between my sampling sites. The reason this habitat variety translates into such impressive variety in bees has to do with the high resource specialization and relatively rapid evolution common among insects. Because insect lifespans are so short (for animals), genetic changes between generations in reaction to environmental changes in their habitat become evident in the population relatively quickly. Once a group of bees find success with and begin preferring a particular set of nesting or floral resources, it will differentiate itself from its relatives with other preferences and eventually separate species will evolve that are no longer reproductively compatible. With such a plethora of available soil and stem types in which to nest, and an even greater variety of flowers from which to collect nectar and nutritionally unique pollens, Pinnacles spurs and supports many diverse taxa of bees. Such dynamic coexistence among bee species presumes complex community interactions and partitioning of resources among these neighboring species. Detailed recording of floral bloom and habitat characteristics, coupled with repeated collection of bee species inhabiting specific areas should allow us to shed some light on ecological relationships between the 400 species crowded into Pinnacles 26,000 acres. Stay tuned for more results. In the meantime, take a trip down California’s I-5 or Hwy 101 this summer and veer off onto the twisty, narrow roads leading to our nation’s newest National Park, also one of its oldest recognized natural areas, and the home of the world’s densest diversity of native bees. There are many treasures to discover at Pinnacles National Park, from threatened bats hiding in the cool talus caves, to majestic condors circling above the High Peaks, to baby birds nestled among rattlesnakes in the tall, undulating grass. Watch your step! 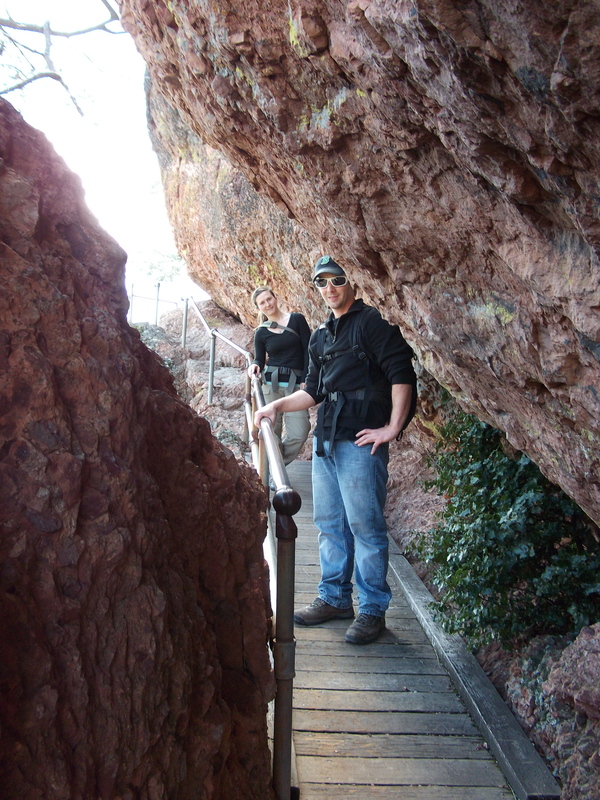 Heading into the Balconies Cave — Flashlights required, picnic recommended. Photo J. Meiners. 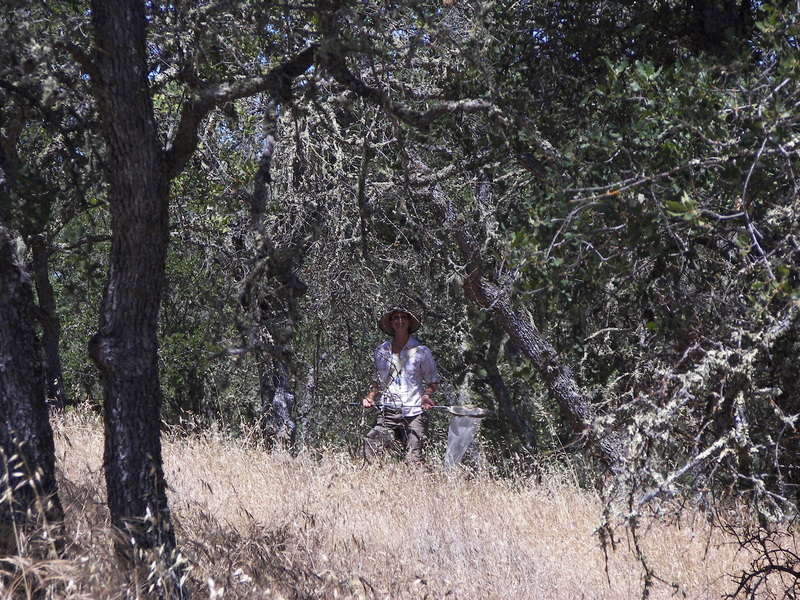 Author collecting in the rarely visited and under-appreciated McCabe Canyon. Photo P. Lamperty. 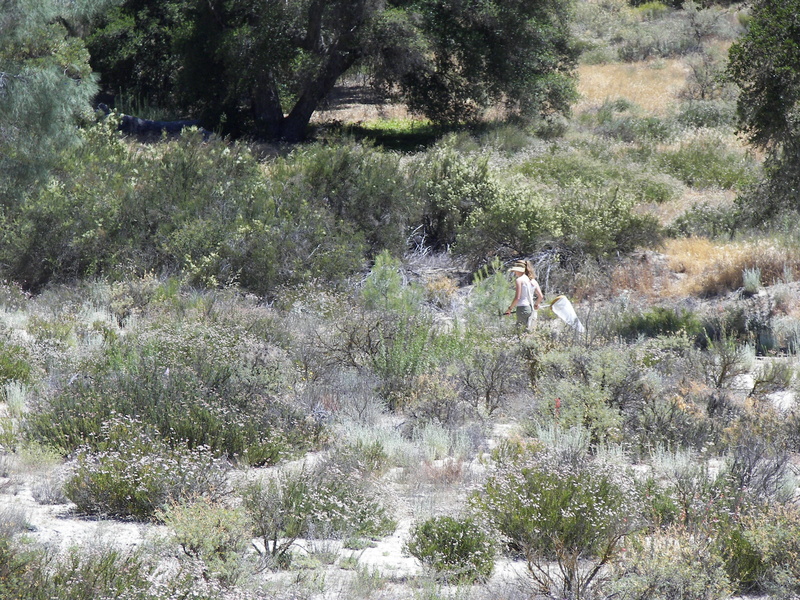 Therese Lamperty collecting in a Blue Oak Woodland on the West side of the Park. Photo P. Lamperty. Up in the High Peaks, amidst circling California Condors. Photo J. Meiners. Hidden gems in Grassy Canyon. Photo J. Meiners. Tunnel Trail back down to the West side parking lot at the end of a long collecting day. Photo J. Meiners. Hiking in the High Peaks. Photo J. Meiners. Watch where you step. 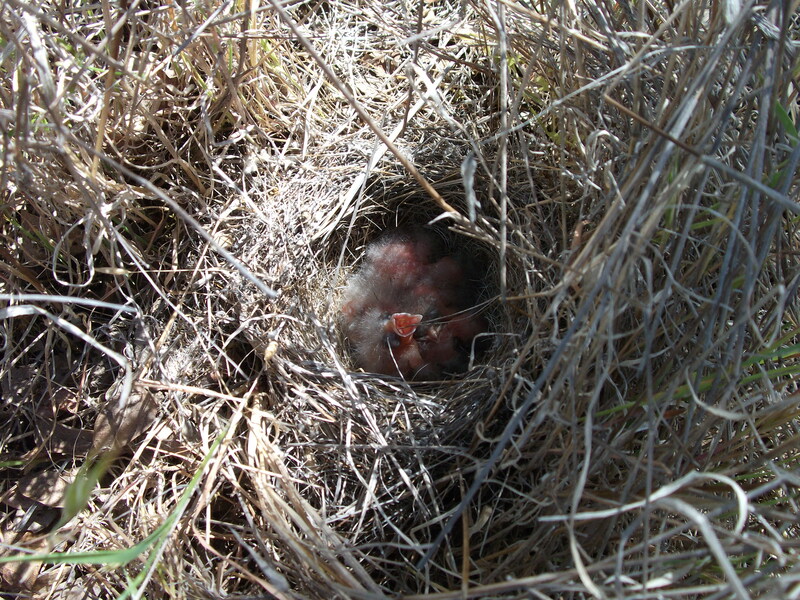 This nest was carefully concealed by the mother twisting the tall grass around the top of the nest. Photo J. Meiners.